Thomas Adler, in liner notes to Kenny Baker Country, County Records, 1976. 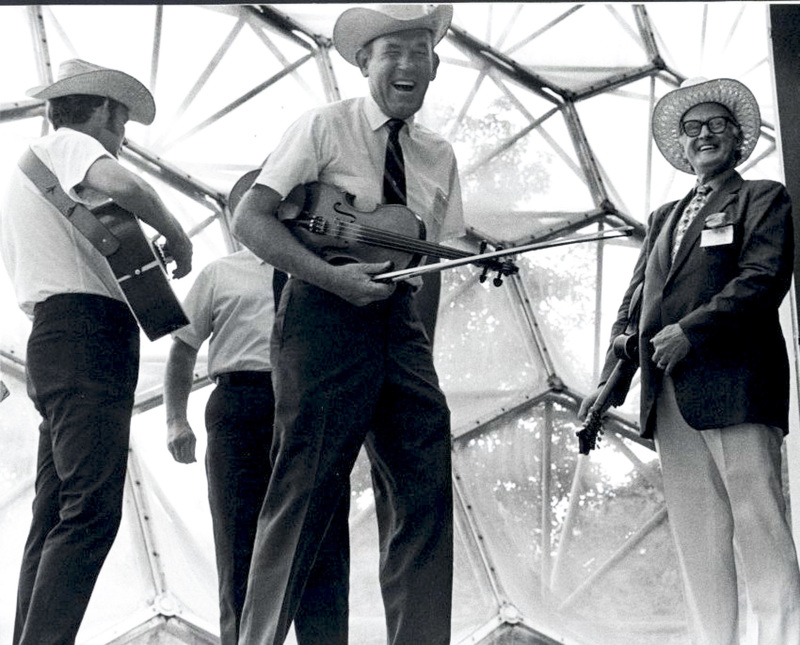 Kenny Baker was the son and grandson of old-time fiddlers. Family roots trace back to England, North Carolina and the coal-mining region of southwestern Virginia. By the mid-1920s his parents had settled on the Kentucky side of the state line. Kenny’s first instrument was the guitar. He learned to play a unique four-finger style in open G tuning, influenced by Ernest Johnson, a blind African-American musician who sold peanuts in Jenkins, Kentucky. For most of his working life starting at age 14, Baker was a deep-pit coal miner for Consolidated Coal Company (later Bethlehem Steel) in Jenkins, taking occasional breaks to play music as a semi-professional and professional. During World War II, he volunteered for the Navy and was stationed in the South Pacific. When a USO show came through, Kenny sat in on guitar and spent the next 18 months playing lead guitar and entertaining troops. He knew enough fiddle to play square dances for the Red Cross in Okinawa. Returning home, he concentrated almost exclusively on the fiddle, except for two albums he recorded on guitar with Josh Graves in the 1970s. In his early days as a fiddler, though surrounded by bluegrass and the music that preceded it, Kenny preferred the jazz style of French violinist Stéphane Grappelli and Bob Wills’ Western Swing. From such influences, he drew lifelong habits of listening intently to fellow musicians, responding to the emotional tone of the moment, and constantly building upon and varying his approach to a tune or break. 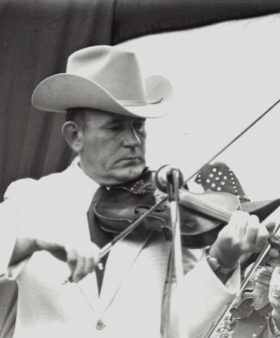 Following in the footsteps of mentor and swing fiddler Marion Sumner of nearby Hazard, Kentucky, in the 1950s Baker played fiddle and sang tenor with Don Gibson’s country band. They were based at the time mostly at WNOX in Knoxville, Tennessee. Bill Monroe enjoyed Baker’s work with Gibson and offered him a job should he ever need one. Baker joined the Blue Grass Boys for the first time in 1957, recording the classics “Panhandle Country” and “Scotland.” When he came back in 1962, he sang baritone on the gospel album, I Saw the Light and was featured fiddler on tunes such as “Big Sandy River,” “Baker’s Breakdown,” “Shenandoah Breakdown,” and “Santa Claus.” Leaving the mines after his two sons were grown, Baker rejoined the Blue Grass Boys and accompanied Bill Monroe on almost every recording he made (an astounding 237 cuts), from November, 1968 to December, 1983. Throughout his life, Kenny Baker listened to fiddlers and fiddle tunes, in jam sessions, on the radio, and on recordings. A musician’s musician, he was highly regarded and often found in the company of predecessors, contemporaries, and disciples. Early festival-goers recall close bonds between Kenny Baker, the North Carolina legend Tommy Jarrell, young Jimmy Arnold, duet partner Joe Greene, and pre-teen James Bryan. In earlier years, Baker had a prodigious musical memory and was able to remember a tune from one hearing. 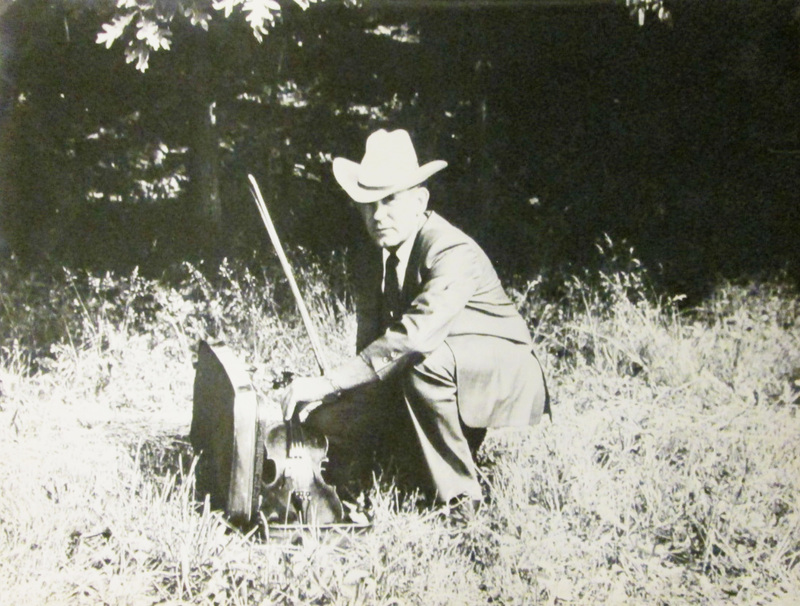 As he worked, in the mines or on his Tennessee farm, he continually reviewed tunes in his mind and thought of ways to improve, combine, or spin an existing melody into another of his own creation. 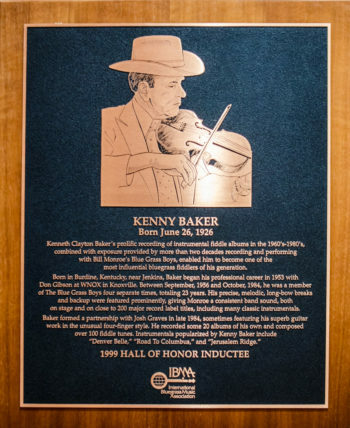 Kenny Baker contributed mightily to the bluegrass fiddle repertoire. His 12 County-label LPs (some recorded in motel rooms between festival sets) received wide circulation. Although he rarely played his original material and arrangements onstage with Bill Monroe, fiddlers young and old learned them from the albums and late-night festival jam sessions. Extensive travel as a musician exposed Baker to a wealth of material –from British Isles to Missouri, Canada, Texas, and southeastern states — which he further propagated. Hundreds of musicians passed through the Blue Grass Boys between 1939 and Bill Monroe’s death in 1996. Although Monroe built upon many of their ideas, his musical relationship with Kenny Baker was by far the deepest and most collaborative. Bill considered Kenny the first worthy heir to tunes he had learned from his Uncle Pen Vandiver in the second two decades of the century. One of Monroe and Baker’s most lasting contributions was the Uncle Pen album, recorded in 1969 and 1970. Another was Kenny Baker’s own Kenny Baker plays Bill Monroe from 1976, in which Bill unexpectedly and uncharacteristically appeared at the recording studio and played mandolin. In private moments, Bill played for Kenny his previously unrecorded and unfinished compositions. Many of these, such as “Jerusalem Ridge” and “Land of Lincoln,” came to reflect the ideas of both men. Kenny functioned as section boss and wrangler for Bill Monroe’s band during his last and longest stay. Retired from a more physically demanding and remunerative career, Baker was resigned to the low wages and constant low-amenity travel of the Blue Grass Boys (selling his fiddle LPs on the road became an important supplement). He trained and oriented each new man, communicating expectations and feedback in a way that the taciturn bandleader was unable to manage. Live recordings from the period evidence an amazing reliance on Baker’s rich, long-bowed fiddling, which often doubled Monroe’s vocal passages. Both Monroe and Baker were headstrong and stubborn. It was perhaps inevitable, but nonetheless tragic that their ways parted over a clash of wills. In the fall of 1984, his brother in the hospital, Kenny was miffed when Bill neglected his request for a touring schedule. On October 12, he walked off the stage permanently after Bill instructed him to play “Jerusalem Ridge” in response to a loud and drunken audience member’s request. 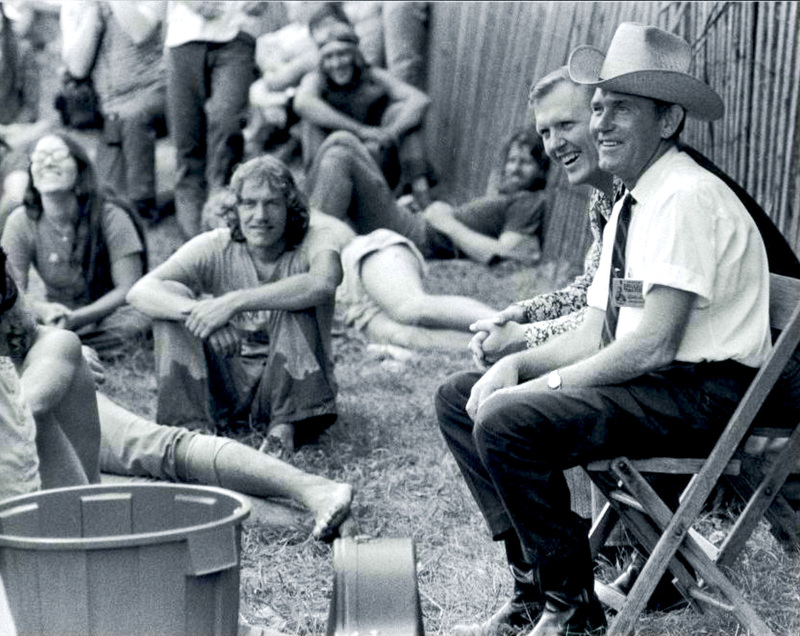 In 1994, near the end of Bill’s life, intermediaries arranged a meeting of reconciliation and an onstage reunion at the Bean Blossom, Indiana festival. After leaving the Blue Grass Boys, Baker teamed with Dobro innovator Josh Graves until shortly before Graves’ death in early 2007 (the two had earlier recorded a pair of guitar/Dobro albums in the ’70s, before a knife accident in 1977 ended Baker’s guitar career). The fiddle/Dobro duo recorded CDs for Ridge Runner in 1986 and Montana in 1987. Baker and Graves made three albums and toured a bit with Jesse McReynolds and Eddie and Martha Adcock as the Masters, beginning in 1989. In the ’90s, Baker toured with fiddlers of many genres as “Masters of the Folk Violin” for the National Council for the Traditional Arts. Kenny made two fiddle CDs for OMS in 2000 and 2002. In his eighties, Kenny Baker seldom played publicly, but was a frequent and welcome guest at bluegrass events. He died in a Nashville convalescent home, a few days after suffering a stroke at the age of 85, on July 8, 2011. Recorded sessions with Hobo Jack Adkins (1950? ), Estill Stewart and the 7 Flat Mountain Boys (1954), Red Rector and Fred Smith (1969), Jimmy Martin (1971), the Down Homers (the Whites, 1972), Bill Clifton (1974), Charlie McCoy (1975), Tom T. Hall (1976), the Osborne Brothers (1978), Wayne Lewis (1980), Dry Branch Fire Squad (1981), Ron Mesing (1990), Mac Wiseman (1990), Mark O’Connor (1993), and Carroll Best (2001). Although he moved close to Nashville in 1968, Kenny Baker always lived in country settings and engaged in farming and animal husbandry. Son Johnny Baker played guitar and sang tenor with the Dry Branch Fire Squad in the late ‘70s and early ‘80s. Other famous Kenny Bakers include a singer/actor who appeared on Jack Benny’s radio show in the 1930s, a British jazz trumpeter of the 1940s, and the diminutive British actor who played R2D2 in the Star Wars film series. Played longer than anyone else with Bill Monroe & the Blue Grass Boys, at the heart of one of the band’s best-remembered sounds. A mentor to many well-known fiddlers, including James Bryan, Blaine Sprouse, and Aubrey Haynie. Bluegrass Hall of Fame, 1999. From the Archives: Danny Jones, Joe Stuart, Kenny Baker and Bill Monroe. Photo by Ron Petronko. From the Archives: Byron Berline and Kenny Baker. Photo by Ron Petronko. From the Archives: Kenny Baker getting his fiddle out of the fiddle case outside. undated. Source unknown. Quoted by Joe Wilson in liner notes to Kenny Baker: Master Fiddler, County Records, 1993. Quoted by Maria Gajda in “Kenny Baker: Country Jazz Fiddler,” Muleskinner News, October, 1972. Doug Green in liner notes to Kenny Baker plays Bill Monroe, County Records, 1976.